Enjoy all the creaminess of ice cream and the fizziness of a soft drink with Marvellous Creations Spiders. 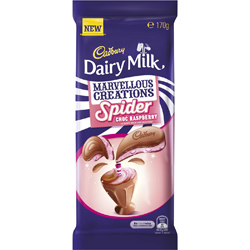 Cadbury Dairy Milk milk chocolate with raspberry flavoured creme and fizzy flavoured candy. Milk, Sugar, Milk Solids, Palm Oil, Cocoa Butter, Cocoa Mass, Fizzy Flavoured Candy (Sugar, Glucose Syrup, Tapioca Starch, Mineral Salt (E500), Food Acid (E296), Colour (E162), Flavour, Thickener (E1401)), Emulsifiers (Soy Lecithin E476), Flavours, Colour (E162).